This shows the mash tun which can hold up to 75 KG of malted grain. Water from the hot liquor tank is mixed with the grain in the tun at a temperature of 67° C. This grist is kept in the mash tun for 2 hours. During this time the enzymes in the grain convert the starch to fermentable sugars. This wort is then drained from the tun and sent to the boiler. The grain is then sparged with hot water to wash all the remaining sugars out of it. This is the 90 gallon brewery boiler. It is heated by two propane gas burners situated underneath, the bricks around the boiler helping to keep the heat in. The wort is boiled for two hours here with hops being added at the start of the boil to add bitterness and a small amount of hops being added near the end of the boil to impart some aroma. This is the 90 gallon fermenter where the yeast is added and the beer fermented during its most active stage. Here the ale finishes the fermentation in a sealed container. 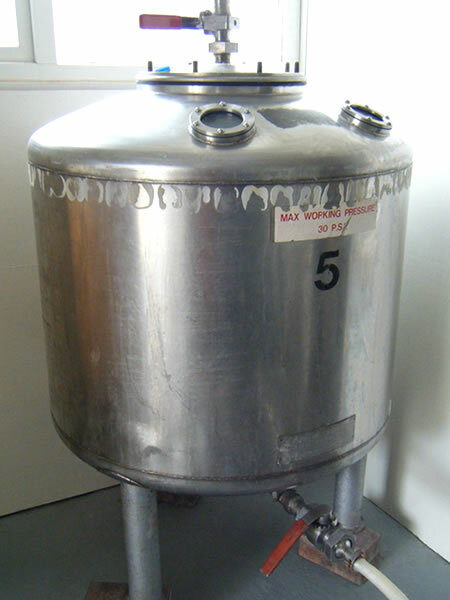 This enables the CO2 gases created to be held over the ale to ‘condition’ it whilst it is clearing naturally. Here the conditioned ale is pumped and mixed with a small amount of brewing sugar and then immediately bottled from this tank. The final journey. 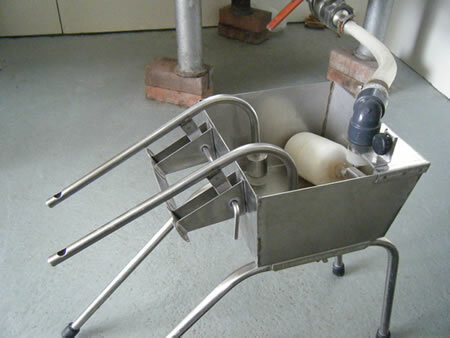 All of the bottles are filled by gravity via this device that is connected to the bottling tank.